This week, when we made the announcement that we will part ways with our trade distributor at the end of 2018, we also announced that we won’t be seeking a new distribution relationship directly with Amazon. We’ve gotten a lot of virtual high fives for this, and there’s also been some misunderstanding about what exactly this means. “I feel terrible because I still sell / buy on Amazon,” is one reaction we get. “But won’t your company / authors suffer if your books aren’t available on Amazon?” is the other. The answer is simple, but the background is complex, and this post is meant to help clarify the relationship Amazon has with publishers, authors, and consumers, and will hopefully give you some guidance in making more informed choices. Our books will, for the most part, still be available on Amazon. Third parties will still sell used (or sometimes new) copies. We ourselves might continue to list many of our titles there, just like you could sell your own copies of them online. We know this sounds like a contradiction. But hear us out. Now, when we sell books through Amazon, we are essentially competing with ourselves and with our best customers, the independent stores. Also, we are getting a ridiculously small portion of the pie, which means that our authors get a very, very low royalty rate on these sales. If, like many publishers, we were to do most or even a big chunk of our business through the big A, we wouldn’t be able to afford to stay in business. But starting in January, we’ll be able to treat them like any other online retailer, selling or not selling books at transparent terms, with fair retail prices that we set. The second benefit to us, readers, stores, and authors is that, we’ll be fulfilling every order ourselves from now on, including any that are placed on Amazon. This means our books will no longer be packed by underpaid, under-trained, and understandably disgruntled workers at vast warehouses. They’ll arrive at your store or your home quicker, in better shape, and with the poster catalogs, stickers, and occasional freebies that our readers love. And when you have an issue with a shipment, you’ll be able to work it out directly with one of our uber-competent and friendly staff members. We do only about 1% of our business on Amazon (4% on our worst month). We expect that far from hurting sales of our books, we will in fact sell more, mainly directly and through independent stores, and that our authors will in turn see greater royalties. Everyone wins. We used to try to find creative ways to get around Amazon’s race-to-the-bottom practices. For instance, we instituted sliding scale pricing on our website, so customers can pay as much as 20% less or more for our published books, as they choose. This has served well in other ways, since folks with limited resources can still affordably buy our books, and those with a bit more to give can offer a bit more. To our amazement, in practice, the average price paid is right in the middle of the scale—cover price. So that’s a feature we’ll be happy to continue expanding upon. If you’re a person who shops on Amazon, we don’t advocate guilt as a helpful approach. When you buy a used book or an older, full-priced book there, that isn’t particularly harmful. But you can improve your purchases’ impact on authors and publishers when you buy your newly-released books from independent bookstores. 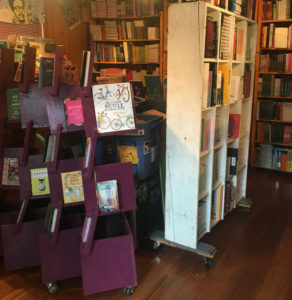 If there are no brick and mortar stores in your area, you can purchase online from independents at Powells.com and Indiebound.com (both of which have affiliate programs, by the way)—and of course from us at Microcosm.Pub!